Ethical, original, sustainable and with all the beauty and style that happens when Italians do something extremely well, Davines has become a Cult classic for countless discerning beauty lovers. 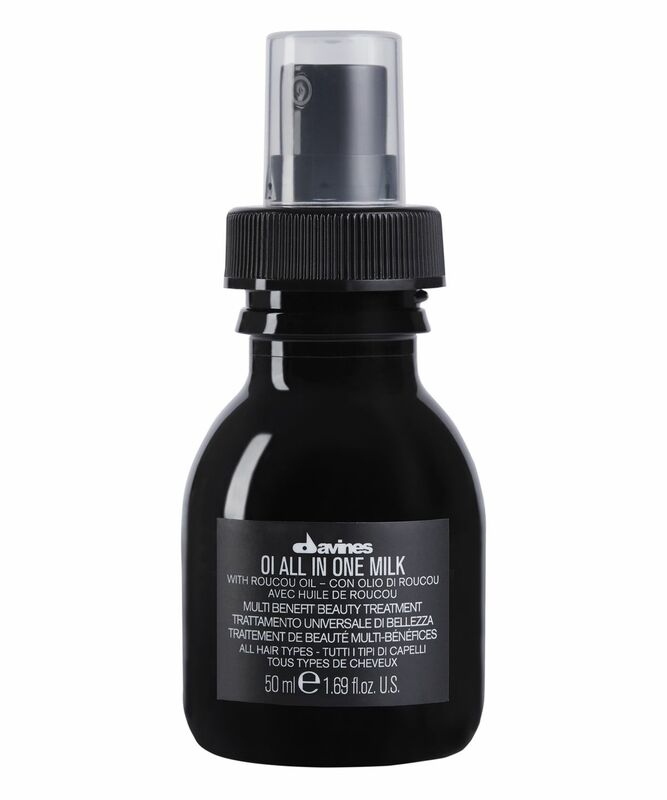 Named ‘all in one’ for a reason, this leave-in formula has myriad mane-taming functions; adding shine, promoting softness, eradicating tangles, minimising frizz, enhancing volume and increasing the longevity of your chosen style (phewf!). It’s ideal for all hair types (the lightweight formula won’t ‘weigh down’ fine tresses) – and because of its multiple purposes, it’s perfect for taking on travels. Davines’s does-everything conditioning treatment is brimming with provitamin B5 – renowned for its phenomenal, hydrating action – alongside roucou oil – a ‘secret’ ingredient beloved by native inhabitants of the Amazon rainforest, who rely on the fruits of the ‘Lipstick Tree’ to protect their skin and hair against the sun and other daily stresses.100 times richer in beta-carotene than carrots, roucou helps to stimulate melanin synthesis (and in turn, maintain your hair’s natural pigment), while its ellagic acid content works to neutralise free radicals and thus protect against cellular damage caused by UV exposure. After using OI Shampoo, towel dry and spray OI All in One Milk 10-15 times on roots and ends: do not rinse and continue with styling. Depending on the type of hair, increase or decrease the number of sprays. Aqua/ Water / Eau, Ceteayl, Alochol, Panthenol, Parfum/ Fragrance, Behentriimonium Chloride, Benzyl Alcohol, Tocopherol, Cetyl Alcohol, Amodimethicone, Cetrimonium, Chloride, Amodimethicone/ Silesquioxane Copolymer, Sodium Benzoate, Trideceth-5, Citric Acid, Glycerin, Trideceth-12 Cyclopentasil,Oxane, Citronellol, Geraniol, Phenoxyethanol, Helianthus Annuus Seed Oil/ Helianthus Annuus (Sunflower) Seed Oil, Linalool, Alpha-Isomethyl Ionone, Limonene, Bixa Orellana Seed Extract. The smell is mixture of a hair dye and something herbal. For me it was OK, but if you're sensitive to perfumes be careful. As for results, It detangled and gave some softness to my curls, but it's not the best that I've seen in my life. My hair is thin, dry, wavy and tangling-prone. So maybe one sample is just not enough. I got a sample with my order, but I’m not tempted to purchase it mainly due to the smell. It’s very strong and reminds me of the smell of hair colour, a chemical smell, not pleasant at all. As to its other properties, it felt slightly smoothing but did no wonders to my dry hair. I bought this after it was used on my hair at the hairdressers and I'm so glad I did! Makes my hair feel so soft and knot free and so shiny too! My hair has never felt so good. Amazing smell, love the product! It makes my hair silky and soft. It’s fantastic! Unfortunately this was not for me at all; I have fine hair and this dried it out really badly. I should have checked ingredients as it contains alcohol which I would always avoid. So be careful if you have delicate or fine hair. I am obsessed with this - it leaves hair smooth and sleek, really healthy looking. And I've also been pretty trigger happy with it before when I've felt my hair needed more moisture, and it's never once made my hair look oily. I also use it when I leave my hair to dry naturally. Can't recommend enough! I saw this on Cult Beauty's Instagram stories and decided to give it a shot as my hairdresser uses davines. I think it does work well in smoothing the hair and holding a style. I like to spray it in when I'm scrunching my hair dry to keep my curls together and glossy instead of frizzy. It does have a strong smell, so be aware of this if you're thinking of purchasing! My hair is curly and corse, I'm always looking for products to give me soft silky hair and this does the job! I love the scent of this product and experiment with the amount I use but I will definitely buy it again and maybe look at the Davines Curl range too. I tried this based on the great reviews, and it stands up to the 5*. I have fine hair and can be oily, but on holiday it gets very dry and I can NEVER be motivated to use a hairdryer. I would have several items to take away frizz and give me the ‘beach touseled look’ however with this little gem I didn’t need any of the other products. Works amazingly well with de-tangling hair and leaves it feeling softer and more manageable. Don't love the smell though; it's a bit too strong for me and the only reason why I knocked off the fifth star. I have used a leave-in conditioner in the past that left me with greasy looking and feeling hair. This one, however, is very lightweight and my hair is always so much softer and smoother after using it. I also use the Oi conditioner, and despite curling my hair almost every day, I haven’t had split ends for a long time. The product itself is really good and does result in shinier hair (my hair is naturally frizzy, colour-treated and just ugh). The only thing to be "warned" against is the smell--it's really strong and strange! I don't see this in other reviews so it might just be me but I find the smell very offputting. It's a testament to how good the product is that I keep using it despite the smell! I love this product! I just bought a new bottle. Please be aware that you can't travel with this product in the cabin bag. I had my new 50 ml bottle and they tested and confiscated at Luton airport!!! It has a chemical in and they said not safe to travel on the plane :(( I was so upset because is the only hair product I adore! I must have the finest hair ever and since going through the menopause my hair has become even finer, I have tried every product on the market to try and help my fine hair look thicker and healthier and nothing worked until now. This product was delivered on Friday and I tried it for the first time yesterday and I have to say I was amazed how great my hair looked after using it. No more frizz, or whispy ends, my hair just looked thicker, healthier and shinier. I love this product and the smell is gorgeous. I highly recommend this product for those ladies who have very fine hair, you will not be disappointed you bought this. I bought the travel size to start off with, as I was buying other Davines products. I'd never heard of the brand but bought this on a whim - and oh my gawd the smell alone I love. I use on both wet and dry hair but I think my favourite way to use it is in the morning. I'm not a morning person and I hate doing my own hair, I'm terrible at it. But I just spray this on to my hands, rub together and then distribute from mid-length to ends - tames my frizzes and I just look a lot more 'put together' with minimal effort. Just upgraded to the 'big size' - my only minor complaint is the travel size bottle - due to the thickness of the product, it's now hard to get the rest of the product out and theres probably about 1/4 of a bottle left. Just hope the full size product isn't a pain. The only product that has solved my frizz problem! I'm in love with this shampoo product, but not the conditioner! Smell is too strong and didn't smooth my hair much. This is such a fabulous product - I'm always sceptical of 'leave in' products as they either weigh your hair down or don't condition enough. This is the perfect balance, although I have to admit that I am not overly keen on the smell, but doesn't stop me using it and the results are amazing! Love this. So good! Detangles my hair so quickly and easily without weighing my fine hair down. Leaves my hair so soft and shiny! A little goes a long way and I even prefer to mix some water in to make it thinner as I use more. It makes brushing through wet hair a dream and gives it a beautiful shine and softness when dry. My only discovery is that it means any waves or curls added don't take so well and my fine hair is flattering the following day. I would think though that thicker or straight haired people wouldn't experience this. This stuff is amazing, after towel drying I spritz all over and blow dry. Makes hair so smooth, silky and shiney. Before using this product and the rest of the OI range I had very over processed, dry and unmanageable hair. My hair is naturally curly and has a frizzy texture to it, but since using this range my hair has been silky, hydrated and easy to style, definitely recommend! Especially the 'All in one milk' I always notice the difference when I leave this product out of my routine. This works so well for my dry and fine hair. Detangles, adds extra moisture and smooths and smells delicious too! This conditioner is the best I've ever tried. My hair is fine, with quite dry and damaged ends, and this conditioner made it feel silky and nourished from the very first application. And it smells amazing too! Great conditioner after shampoo. I don't lose any hair in my comb when using this. Gives my fine, wavy hair body and shine. I am taking only this and the shampoo (decanted into a smaller bottle) on holiday. The smell is beautiful - like an expensive perfume - rather woody and amber-like. Make sure you like the scent as it could be overwhelming for you. Personally I love it. Very good stuff for your hair. I’ve been using for more than a year. My hair is blonde and was dry, so I bought that spray and can’t believe how my hair looks now. It's a very big difference. 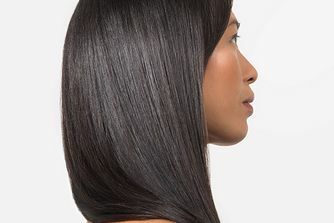 Don't make your hair oily and dry, more silky and nice. Recommended. I was sceptical about this as I've tried so many hair products - I'm growing my hair but I also have it coloured regularly so it can sometimes be a little bit fluffy the day after I've washed it, this really helps - I spray it onto my hands and work it through rather than spraying directly onto my hair, using 8-10 squirts for shoulder length hair. I will definitely repurchase this when I run out. I used as directed after shampooing and found my hair to be quite limp and greasy after, despite not using much product. However when I use it after my usual conditioner it works as promised. My hair is shinier, easier to style and feels thicker. I have recently started using this and I’m really impressed. I have quite thin hair and regularly have strands of hair falling out, however since using this my hair is so soft and shiny, and hair loss seems to have improved. It doesn’t leave your hair feeling greasy or weighed down like oil sometimes does. I will definitely continue using this. I have curly, frizzy, fine hair and this product works wonders for me. It keeps my frizz at bay making it look strong, shiny (which my hair never does ) and healthy. It is also amazing at de-tangling my hair which is so knotty usually! I have tried many products and this one is definitely a keeper! I would agree that the spray mechanism stops after a few squirts, which is slightly annoying. I’ve used products before that have made the same claims as this product and none have come close to doing what they say until I used this one. I dread having to wash my hair- even though it’s shoulder length, as it takes ages. I have a lot of fine hair that falls flat after I’ve styled it. Well, I sprayed this in and dried my hair which took a third of the time to dry than usual. I then styled my hair in beachy waves which usually fall out straight away, 2 hours later and it’s still holding up, most have dropped but looking batter than usual. If I ever run out I would defo but it again and swap all my hair products for this. Finally, a product that actually works. Smells great but the product did not work for my thick hair. It did make it easy to untangle washed hair but not effective as a frizz tamer even though I used it as advised. The product also was difficult to use for me. It would stop spraying after 4 to 5 pumps. In search for a good leave in conditioner still. I had debated purchasing this product for a while as it is quite expensive. But I had heard and seen great feedback on this product so I decided to purchase it. I am so happy that I did. It smells lovely and the spray nozzle makes it easy to distribute product throughout your hair. I spray from it on my hair from mid way down towards the ends. After three weeks, I can say that my hair is softer and it doesn't have many split end. My hair is less frizzy during the day and looks healthier. Amazing product and quick delivery. I want to scream to everyone about how great this product is. It's just amazing. Makes my hair smooth as a silk. Literally. And oh the smell!! The smell is to die for. I want to rave about this product to the whole world. People who knows me already think I'm a brand ambassador of this product. By the way is it possible to be one? Oh what a dream would that be as I highly doubt I can afford the next bottle given my no job status at the moment. Anyways let focus on the product. It's just Stupendo fantabulously phantasmagorically magical. I love, love, love this product! It smells so good, detangles my hair ridiculously well and makes my style last for days! Before my hair would be a mess in the morning, now it holds in between washes. I cannot recommend this product enough!